Canada’s business landscape is constantly evolving, and while there are many opportunities for companies interested in doing business here, there are also legal and operational complexities to consider. 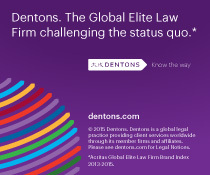 To help navigate the business environment, Dentons has created this easy-to-use guide that highlights current issues, regulatory and policy changes, legal precedents and trends affecting business owners. The 2018 Doing Business in Canada guide is an invaluable tool for companies considering Canada as part of their growth strategy. Federal consumer product and labelling standards. On October 1, 2018, the US and Canada announced they reached a tentative deal for a tripartite trade agreement to replace the North American Free Trade Agreement (NAFTA). If ratified by all three countries, the US–Mexico–Canada Agreement (USMCA) will have a profound impact on Canada’s automotive, pharmaceutical and other industries, as well as protected agricultural sectors. In the summer of 2018, the Federal Court of Appeal reversed the approval of Canada’s CA$9.3 billion Trans Mountain oil pipeline expansion, noting a lack of consultation with the indigenous community. That ruling was overturned by the Supreme Court of Canada, raising questions around “duty to consult” and courses of action involving controversial energy projects opposed by the Indigenous community. The Government of Canada’s new carbon pricing system is set to come into effect on January 1, 2019, and provinces and territories must meet federal benchmarks. Some jurisdictions are on board, and others are disputing it. Two provinces are challenging the federal government’s right to impose a carbon tax in court. The Safe Food for Canadians Regulations will come into effect on January 15, 2019, and will entail significant changes to labelling, standards of identity and grade requirements. Amendments to the Canadian Trade-mark Act relating to trademark registration and protection are expected in 2019. Canada is a great place to do business. If you are interested in learning more, our talented team of legal professionals are located in Canada’s major business centers and are ready to help you explore “why Canada?”.